Man o Man... Boy oh Boy.. I am off and running with some masculine birthday cards. 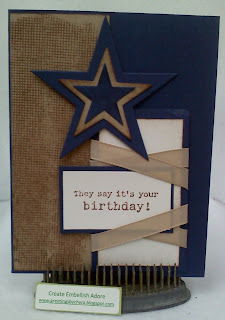 This card has the stars layered and then on dimensionals. I sponged the edges and though I should have wrapped hemp on it, I used the kraft ribbon. 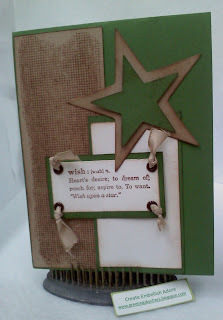 The background & sentiment stamp are both retired, but still in my stash. Some things you just never tire of! Again, the same layout, but color & sentiment change. I added 4 eyelets and knotted the ribbon - gave it a different look. Do not worry, I will still be practicing my manly cards! It also helped that the Latenightstampers had a "birthday" challenge!